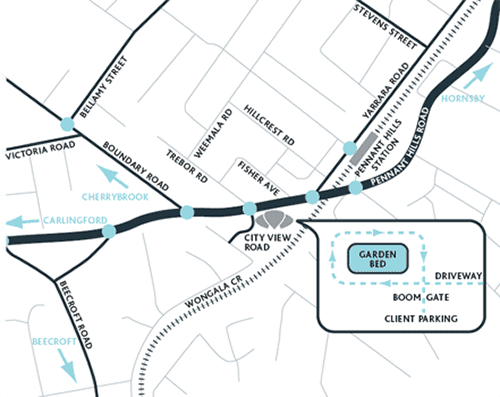 Turn off Pennant Hills Road at the lights on to City View Road and take the first driveway on your left. Keep veering left before making a loop around the garden bed to reach the car park underneath the building. To enter the car park, simply drive up to the garage door and press the intercom button for BFG Financial Services. Our team will answer your call and let you into the car park. You can park in our BFG labelled visitor parking which is located one level up when you drive in. Please drive directly up the ramp to Level 3 turning left at the top of the ramp and proceed forward to park in one of our visitor car spaces located on your right or left. You will then be able to catch a lift to Level 10. To leave the car park please proceed to the garage door exit and the boom gate will automatically raise allowing you to exit the garage door turning left to retrace your steps back to Pennant Hills Road.